The 5th North American Ornithological Conference will take place at the University of British Columbia in Vancouver, August 14th to 18th. While most BCFO members will not register for the full conference, there are some excellent, lower-cost ways for members to enjoy aspects of the Conference. 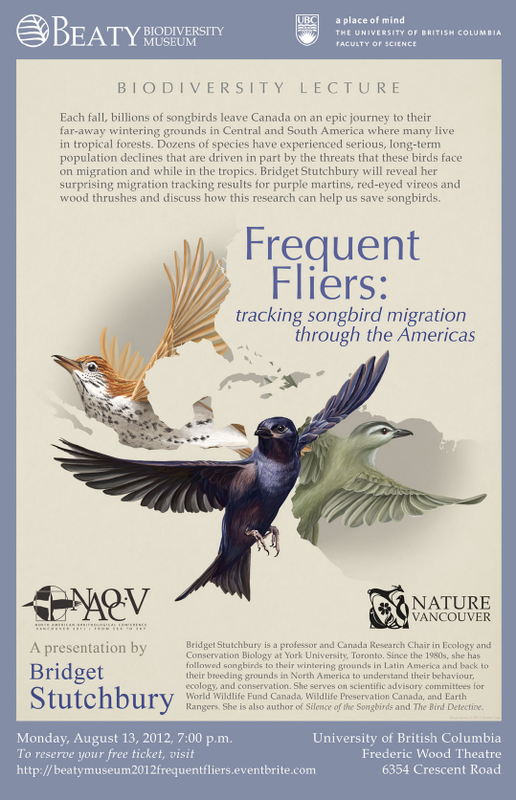 The first is a pre-conference, FREE PUBLIC LECTURE by famous Canadian ornithologist and author of Silence of the Songbirds, Bridget Stutchbury. Early morning bird trip to coastal Iona Beach Regional Park and fabled sewage lagoons! 1300-1700 – PIF Student Symposium : Careers in Bird Conservation – What does it take to get started? The Western Working Group (WWG) of Partners in Flight (PIF) will be holding a one-day meeting in conjunction with the North American Ornithological Congress (NAOC) in Vancouver BC. The meeting will be held on Tuesday August 14th, immediately preceding NAOC. The first half of the day will focus on tri-national collaborations, building on momentum from the meeting held in Mexico last fall, including grassland conservation, Chiapas Appalachian Pacific Alliance, Alianza Sierra Madre Occidental, and other conservation efforts crossing national borders. The latter half of the day will include topics emphasizing conservation opportunities for Northwestern forest birds, including bird conservation in Ponderosa pine and mixed-conifer habitats, informing priority species lists and federal planning processes, and full-life cycle stewardship. Additional agenda items include updates on WWG projects, including follow-up from our spring sagebrush workshop. We are hoping for broad attendance from participants spanning the tri-national area. Please contact Jaime Stephens, <mailto:jlh@klamathbird.org>, if you will be attending so we can arrange appropriate space and snacks. Cost to attend this session is $25.00 to cover the coffee breaks. Session starts at 9:00 am. SOCCER FOR BIRDNERDS? The Partners in Flight Western Working Group has started a tradition of having a friendly & fun soccer match to unwind after a day of meetings. Join us for a casual soccer game after the meeting, from ~5pm until ~630pm on Tuesday, August 14th @ Mac Innes Field directly beside the SUB on the UBC campus. ALL SKILL LEVELS welcome, just bring cleats/sneakers & be ready to have fun!